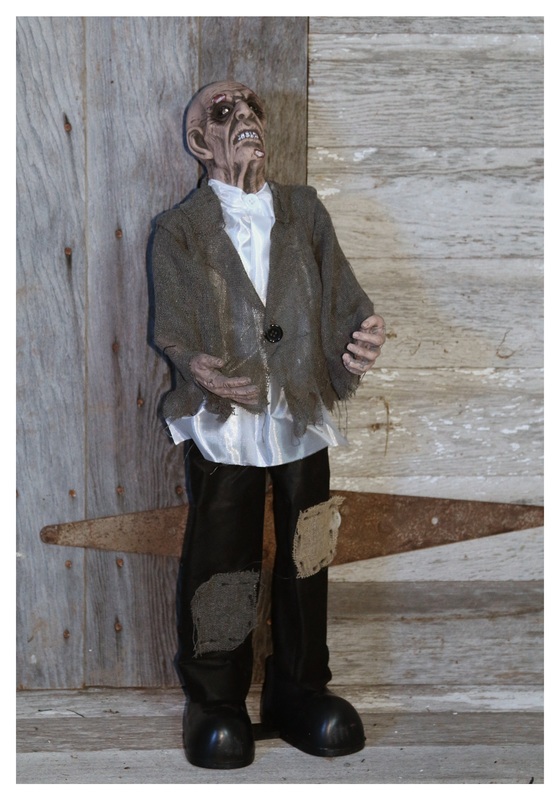 Makes a great scary door greeter, or bathroom attendant! Do you ever wonder what zombies do when nobody is watching? Do you suppose they just go about their zombie business and keep on looking for fresh brains to gorge themselves on? Or would you bet there is a secret life that zombies live when they are free from prying eyes? Maybe they find comfort in doing repetitive tasks from their former human lives. Or maybe they group up with other dead dudes and act out scenes from movies to pass the time until an unwitting survivor stumbles across them. You can wonder what zombies do in their spare time all you want, but as soon as you take a closer look they will go right back to trying to bite your face off, just like this Grey Moving Zombie Prop! Standing 30 inches tall, this zombie doesn't come in short on scares. His tattered suit and pants mean he'll meet the dress code for almost any party you invite him to, and when he's activated he'll frighten the heck out of everyone with his creepy movements and spooky laugh! Just be sure to feed him before the guests arrive.